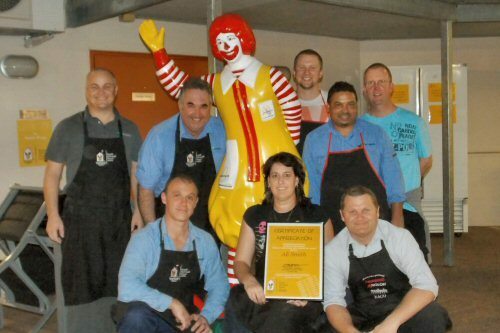 As part of AE Smith’s community support of Ronald McDonald House (RMH) around Australia, the Brisbane AE Smith team decided to arrange a ‘Cook Night’ at RMH House Mater recently. Office Administrator, Carolene Jacinto, rallied eight of AE Smith Brisbane’s best cooking enthusiasts to plan, prepare and then cook a feast for 35 guests of the RMH House. “We all really enjoyed just helping people forget the stresses of what they are going through by giving the families a lovely meal,” says Carolene. “It’s pretty humbling and to be able to help in a small way is something we were all keen to do,” she adds. AE Smith Service General Manager in Brisbane, Matthew Steele also ensures support of the local Ronald McDonald House by providing pro bono air conditioning maintenance and service – a commitment matched by other AE Smith teams around the country to RMH Monash, Parkville in melbourne, RMH Perth, RMH Townsville and RMH Westmead in Sydney. “RMH Mater is such a special place. I am constantly impressed by the wonderful work they do and providing free labour for air conditioning is just one way we can help,” says Matthew.